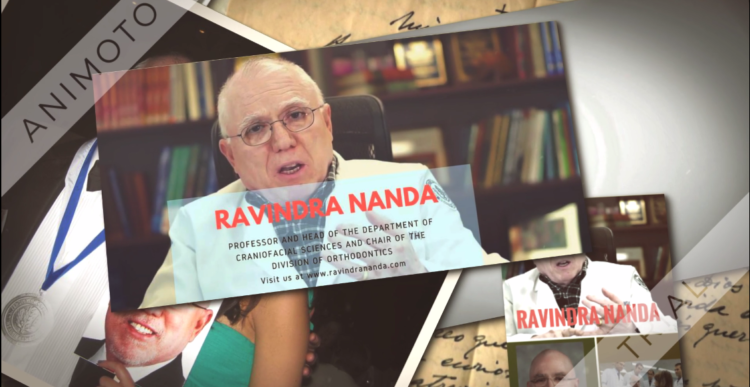 Famous for his research in craniofacial orthopedics, the biology of tooth mobility, and biomechanics, Professor Ravindra Nanda has accomplished much more in the field of Orthodontics. As a mentor to the students, he has given 4 decades of his life to the University of Connecticut. He has achieved a lot in his career. Dr. Nanda pursued his graduation in Orthodontics from King Georges Medical College, Lucknow University. In the year 1964, he completed his post-graduation, under the guidance of his brother Dr. Ram S. Nanda, who was the Head of the Department at Lucknow University. During the master’s in dentistry, Dr. Ravindra Nanda started his research and wrote his thesis on “Cephalometric Study of the Dentofacial Complex of North Indians”. The Indian Council of Medical Research selected the thesis for the scholarship research grant. In January 1969, and was published, for the issue of the Angle Orthodontist. In the same year, Dr. Nanda completed his Ph.D. in philosophy from Katholieke Universiteit, Nijmegen, the Netherlands. After receiving his Ph.D., Professor Ravindra Nanda joined the Loyola University in Maywood, IL as a fellow Assistant Professor. He served as a faculty member for two years and then in the year 1972, he moved to the University of Connecticut to continue his career. He received his Certificate in Orthodontics in 1978. As a professor, he mentored his students throughout. Later in the year 1992, he was promoted as the Head of the Department of Orthodontics. Professor Ravindra Nanda, in 2004, started to lead the Department of Craniofacial Sciences that covered the divisions of Pediatric Dentistry, Advanced Education in General Dentistry, and Oral and Maxillofacial Surgery of Orthodontics. Dr. Nanda is a former president and current member of the North Atlantic component of the Edward H. Angle Society of Orthodontics. He has edited a number of journals, including Management of Complex Orthodontic Problems, the Symposium in Orthodontics, the Normal Palate and Induced Cleft Palate in Rat Embryos, etc. His current journal is Progress in Orthodontics, for which he acted as an Editor-in-Chief. The Journal of clinical orthodontics is another monogram that he edited as an Associate Editor. He is also a member of the editorial board of nine national as well as international journals. The excellence of Dr. Ravindra Nanda made him honorary member of various societies related to the field of Orthodontics, including Connecticut State Dental Association, the American Dental Association, the European Orthodontic Society, the International Association of Dental Research, the American Association of Orthodontics, the College of Diplomats of the American Board of Orthodontists, and the Hartford Dental Society.